Hailing from Canada with a permanent base on the west side of Los Angeles California, Rhiannon Roze jumps in the studio with the ADSR production team, to deliver her first vocal sample pack via ADSR Presents: Rhiannon Roze. Rhiannon was featured in the “Rock The Box” documentary along side a DJ Mag Canada spotlight with Hardwell and Max Graham. Roze has played all over the globe sharing the stage with heavyweights like Tïesto, R3hab, Chris Lake, Kaskade, 21 Savage, Wake Flocka & Pitbull. Now as an independent artist, Rhianon Roze goes from stage to studio and her original sound is stirring up waves on dance floors everywhere. Feature a respected vocalist on your next track and let Rhiannon’s distinctive tone and the original phrases and chops featured in this collection take your productions to new heights. This soundset is literally packed to bursting with as much inspiration as it is with solid, useable samples and sounds. 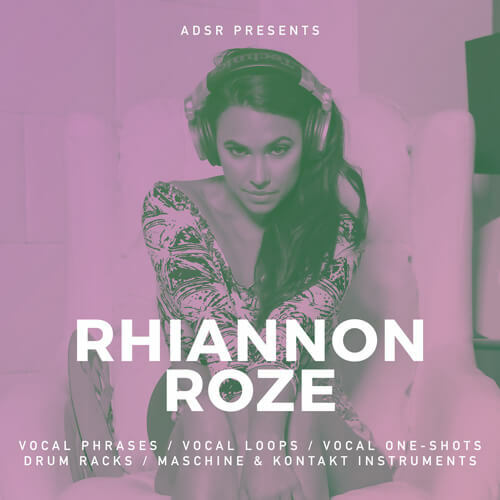 ADSR Presents: Rhiannon Roze includes over 450 vocal samples, phrases, chops and oneshots. Both wet and dry versions have been provided along with single sliced elements for creating your own chop combinations in your favorite sampler. As an added bonus sampler instruments for Maschine 2.0, Kontakt 5, EXS 24 and Ableton Live Drum Racks have been provided with all samples pre-mapped and ready for production. Serum presets were also created using the single vocal slices which opens up new possibilities for synthesis or simple payback with effects. These vocal phrases work over a variety of musical genres such as Bass, Trap, Future Bass, Dubstep, Riddim, Hip Hop & Twerk.